Use 1-2 pumps and apply twice a day throughout pregnancy from above bust to below the bum. Continue use for four months after the baby arrives. I am 3 months pregnant and try to find best product for my tummy and baby too. Finally i found this one its smell really good. I will buy it more! I have used this everyday during my pregnancy so far (I am currently 28 weeks). I alternate using the Oil and the Tummy Rub Lotion. It smells so good and soaks in well. Leaves me feeling very moisturized but not greasy. I love this product and can't wait to see the final results at the end of my pregnancy! Gave birth at 40 weeks not one single stretch mark. Love it but not that great! I used this oil during my whole pregnancy. I'm giving it a three stars because I still have stretch marks that appear even thoug I used it how it was indicated. The plus side on this is that I loved how my stomach felt when I put it on me. Also, I did not feel like scratching my belly at all which it was a plus. I started using the tummy rub oil religiously since the 10th week of my pregnancy. I am on my 33rd week. Stretchmarks started to appear on my 32nd week. I'm kinda sad that I spent all that money and it didn't work for me, but the oil helps relieve itchiness so i guess it is not too bad afterall. I think it depends on your skin too. There are just some women who will get it no matter what. I'm on the smaller side so my skin stretched so much and reached it's breaking point I guess. I still have 1 and 1/2 bottle left so I'm still going to use it until it runs out. Good luck, mommies! It worked for me 5 years ago! Just reordered as I am pregnant again. I got through my first without any stretch marks and I hope I can stay this way! I am praying that you didn't reformulate!! This is my second pregannacy using the tummy oil + tummy butter! The lightly scented smell is amazing since sense of smell is off the charts while pregnant! I was wondering why I have ran out so quickly of the oil and found out my husband has been using it on his arms + tattoos! I don't mind one bit, gives me more of a reason to stock pile! I bought this for my younger daughter, who is expecting a baby in October. She absolutely loves this oil and was getting rather low, so I reordered it for her. She's been using it at the recommendation of other expecting moms! I used this oil during my entire pregnancy. I gained 31 lbs and had a GIANT round belly. During the last few weeks of my pregnancy I put the oil all over my belly in the morning and at night. I managed to only get a few barely noticeable stretch marks above my belly button. That's it! I will definitely be using this oil again with my next pregnancy. This product is great. I used it for my last pregnancy and my current. I use it twice a day and It has helped prevent stretch marks from forming. I love the way this feels - so much better than the tummy rib butter! Not a stretch mark in site! 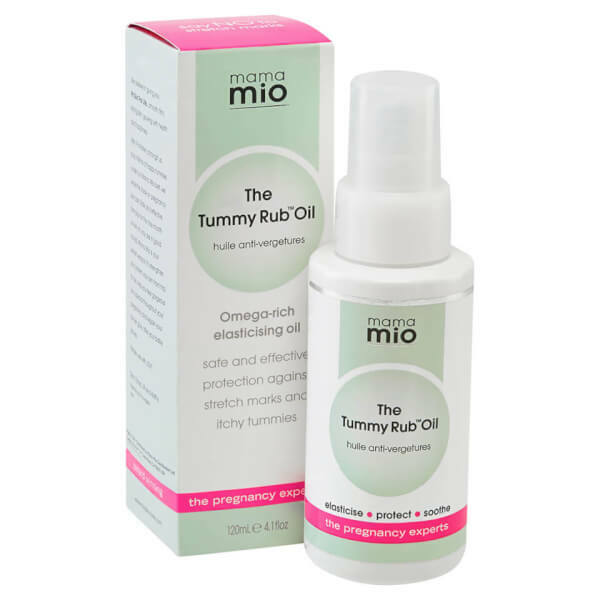 I love Mama Mio Tummy Rub Oil! I've been using this product since I was 18 weeks pregnant (currently 32 weeks) and I don't have a single stretch mark in site. It smells great, goes on and absorbs easily and a little goes a long way. Great for my evening tummy rub routine, my husband loves to put it on for me as well. I would highly recommend this product and will continue using it well after labour to ensure no pesky marks appear! A must have for all moms-to-be! I've used this oil with both of my pregnancies, and I love it! I came out stretch mark free with my daughter and so far so good with my son. I just use it once in the morning, and my skin stays hydrated through the whole day. Best stuff ever! Customer since 2006! First pregnancy I got it as a gift and I was in love, no stretch marks. Second pregnancy, I purchased two bottles and loved it still and no stretch marks! It's an oil and it really soaks into your skin but not greasy. I use it right after the shower. I liked the older packaging product it came in a glass form instead of the plastic. I love this product! It is oil-based, but not greasy! I'm only 13 weeks along, but I started using it already to get my skin ready. I'll have to go back and make another review after the pregnancy. And oh, did I mention that it smells awesome?! This was recommended to me and lived up to its recommendation. A really good friend of mine told me about this product! I started using this product before bed every night around 16 weeks. I am now 31 weeks and currently no stretch marks!! I was a little put off by the idea of an "oil" because I felt it would leave me feeling too greasy or get all over my clothes. This product is amazing.....it goes on like an oil but leaves skin feeling hydrated and glowing. I have a little left in my first bottle and placing a new order today for another bottle. I wouldn't and don't use anything else!!! You won't regret this purchase!